Another post! 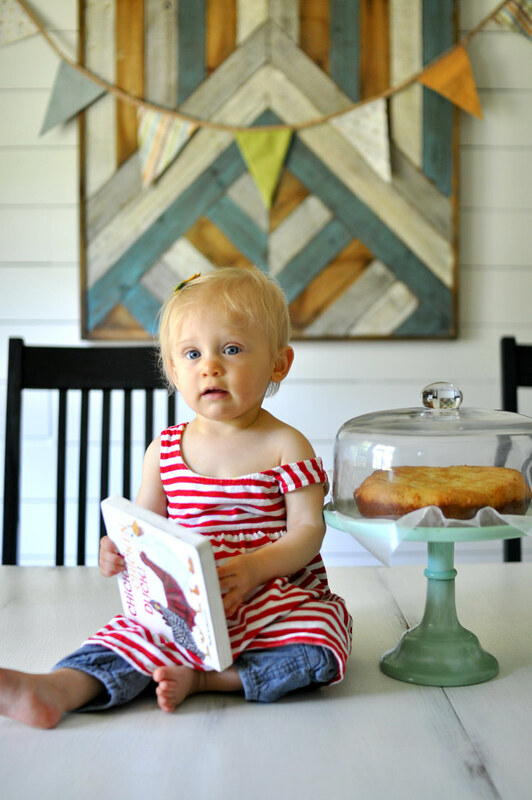 We got a lot of nice birthday wishes for Eloise -- thank you! 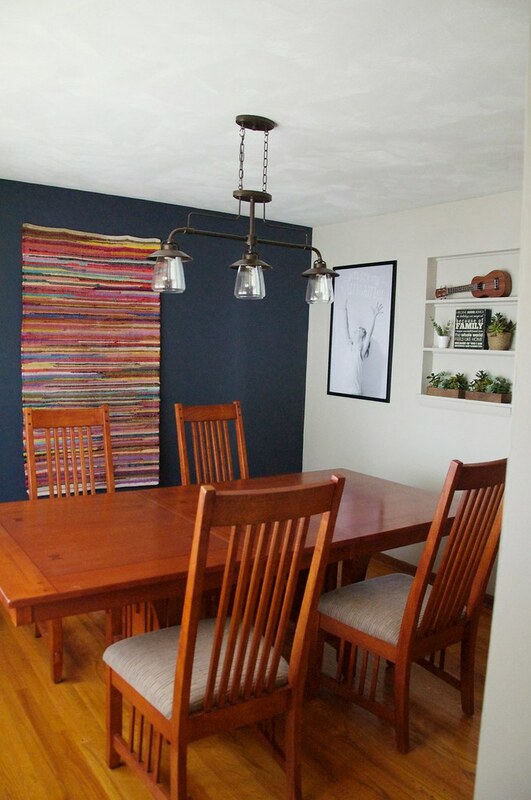 But I'd also say after posting this photo, I got a ton of requests to talk more about our updates in the dining room. It's definitely been a while since I've written about what we've changed in the house. And we've changed quite a bit. So, let's get to it. Then I decided to go full-on Joanna Gaines. And I think we're finally done with changes. Major changes included added the corner cabinet that I found at an antique shop. I had stalked the piece for years, and it finally went on a super sale. It's just the right height for the room. It looks built in, which I love. The room isn't huge, so it's nice to have a place to stash our nicer pieces and tablecloths. 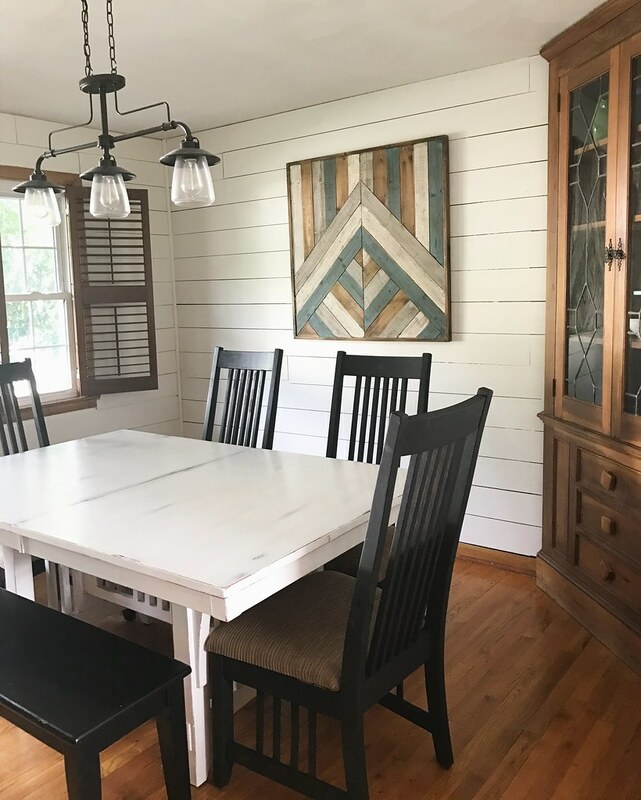 The next step was doing a faux shiplap on the walls using plywood planks. I am actually going to do a dedicated post on how I did this because I consulted a variety of sources, and it was quite a job! I did it all myself, too. We had a guy cut the plywood into six inch planks, but I did all the measuring, nailing, and shorter cuts at home. After the planks were up, we painted everything using White Dove from Sherwin Williams. I think it's actually a Benjamin Moore color that I had matched at our local store. I hate painting, and if I'm being totally honest -- I think we need another coat in this room. Maybe Stephen will be generous enough to do that for me this summer. 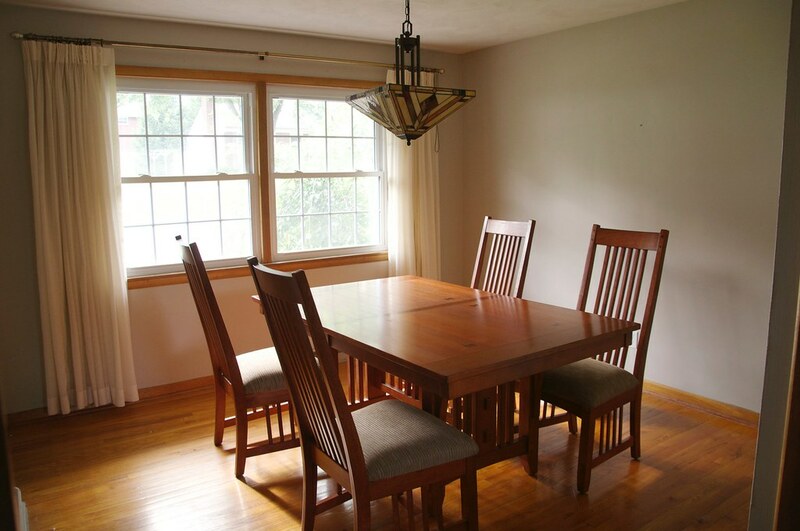 You may also notice that our dining set changed in these photos. 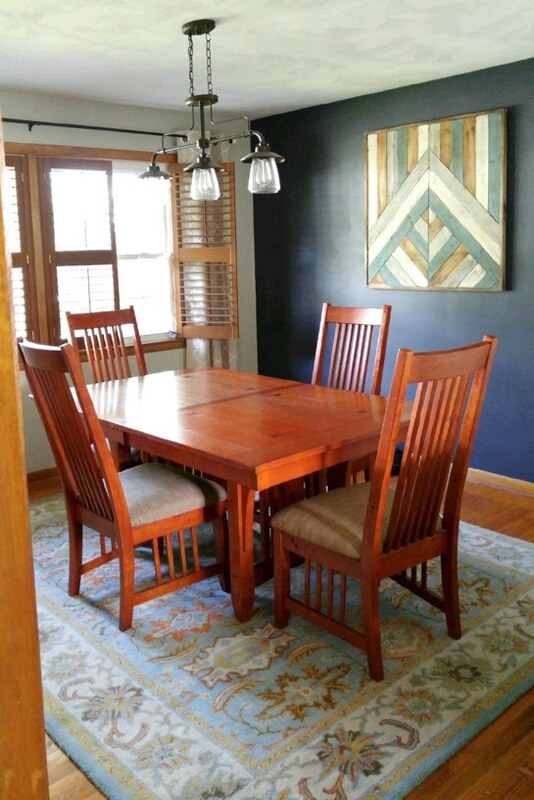 It's the same set, but I used chalk paint to refinish the table in white and the chairs in black. I still need to give the chairs another coat and do the polyurethane. But I am really pleased with how the table turned out. I did some distressing . . . and it is holding up well so far. 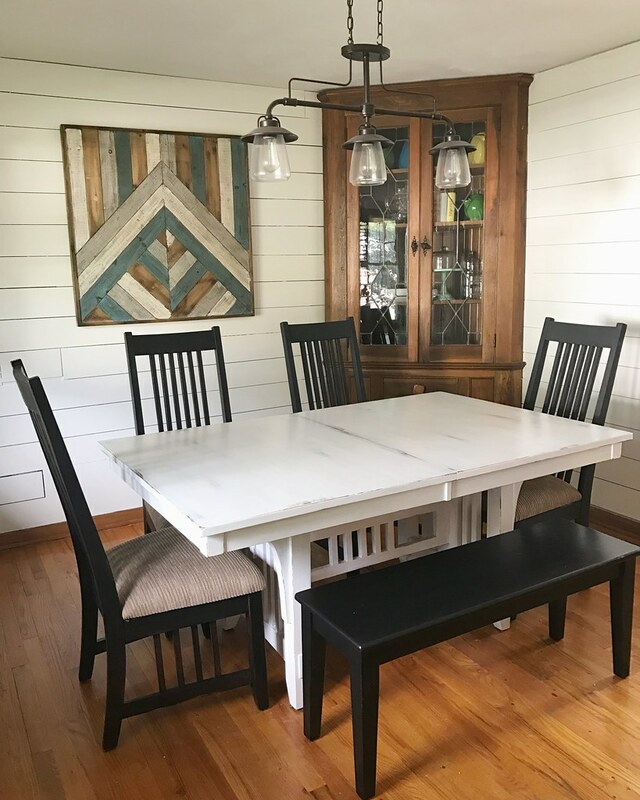 My kitchen is a disaster right now, but in my post on how I did the shiplap, I'll try to snap a shot of how this room flows into the kitchen. The two spaces are nicely tied into one another now. Again -- after all these changes in the three years since we've moved into this house -- I think I'm done. I really love this room. It's my favorite in our home right now. PS: If you want to see what our house looked like back in 2015, be sure to check out the photo tour. It's in dire need of updating, so I hope to do that soon! I cannot believe how crazy the living room looks in these photos! I also stumbled upon the tours I did of our first house. Here and here and here. PPS: That plank wood art piece came from Home Goods several years ago. We have a similar one in our dining room. They were on the more expensive side for what I spend on art, but I think they were well worth it.